Live Download Series #010 travels back another three years behind #009, to the time when Frisell made the break from his early days at ECM, and the start of what would become a two-decade run for Nonesuch. It also further demonstrates the fundamental difference between live and studio recordings. "Unscientific American," which appears here long before Frisell would record it as a structured, 48-second miniature on This Land, is a more expansive eight-minute piece, where its idiosyncratic theme acts as a jumping-off pointâ€”and, mid-piece, rallying pointâ€”for collective improvisation, while Lookout for Hope's "Hangdog," this set's opener, goes to far more extreme places than its studio counterpart; Frisell's overdubbing replaced by a repeated bass/cello pattern that drives an overdriven guitar solo, far edgier and expressionistic than anything he's done in recent years. With other material from Lookout and Rambler, the high point of the 80- minute set is the extended version of "High Planes Drifter," from Frisell's Elektra/Nonesuch debut, 1989's Before We Were Born. Arranged by the New York Downtown scene's influential John Zorn, it reflects a very different Frisell from what came before...and what would come after. 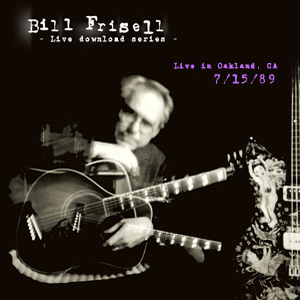 During Frisell's own New York days, he moved away from the ethereal atmospherics of some of his earlier ECM work, towards a more aggressive tendency that, nevertheless, reflected the almost geeky idiosyncrasies of a guitarist as capable of ear-shattering shredding as he was moody tone poemsâ€”a broader range of expressionism that was prerequisite for his membership in Zorn's Naked City. Still, the episodic "High Plains Drifter"â€”with its rapid section-to-section shifts that reflected Zorn's own writing at the timeâ€”is all Frisell. There may be harsher sonics, harder surfaces and more jagged edges than his later workâ€”this was before he developed a love affair with loopingâ€”but there are still plenty of signposts of what would come, including direct allusions to country and roots music, albeit delivered in a high-velocity, cartoon-like fashion.